05-Jun-2016 -- This is the last out of 3 reports reaching confluence points in Southern Norway. The story starts from 60°N 12°E and continues from 61°N 12°E. The night before I had cycled until 11:30 PM until I had set up my tent in the forest between Elverum and Hamar. The next morning I continued cycling over a little county road directly to Brumunddal, which is clearly the starting point of any visit to this confluence point. Two roads lead to the confluence, a hilly gravel road on the left side of the river Brumunda and a smooth asphalt road (Brumundvegen) on the right side of the river (looking down the river). Both roads lead to a small place called Brumund sag, which is about 2 km from the confluence as the crows fly. I was able to cycle further on forest tracks up to an intersection of two tracks located 1200 m to the west of the confluence. 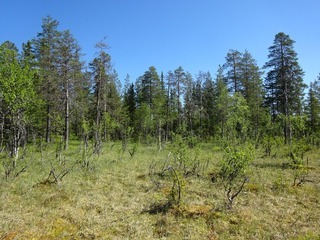 The hiking part offered diversified landscapes, beginning with a logged open area, followed by a dense and hilly forest. As I approached the confluence, the terrain became flat and swampy. I found the confluence after crossing the swamp about 20 m into a conifer forest. On my way cycling back from Brumund sag to Brumunddal I used the asphalt road which turned out to be 3 times faster than the gravel road that I had come. After a lunch in Brumunddal, I hurried up cycling back in order to catch my plane at Oslo Airport. I just made it back in time – but always being a bit worried because the required cycling time had been hard to predict.